My mid-life crisis arrived ahead of schedule, and in the form of running. Needing to fit in clothes that no longer fit inspired me to incorporate running into my exercise schedule. I struggled with a mix of running and walking for a few days, then graduated to running continuously, and started signing up for road races. The 2015 Shamrock Run 15k was my first race, and I quickly realized I was hooked. Since then I’ve run various distances, including over forty half-marathons and a few marathons. 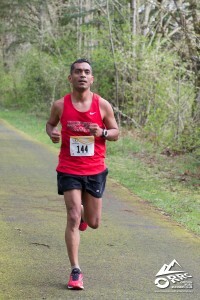 I encountered the Team Red Lizard pacing team at the 2015 Portland Marathon, and joined the club in early 2016. The club is a fun group of motivated runners, welcoming people of all paces, full of banter and camaraderie. The group runs are an excellent way to find a peer group to keep you running. I have also participated in and enjoyed many of the Lizard social activities, and hope to participate in at least one weekly group run, and to be at each group run at least once a month when I’m not training for a marathon. I’m happy to be the club’s membership director. Please feel free to contact me if I can help. Group runs are free, and we encourage you to run with us regardless of whether you choose to join the club.